Lyrics to the song Don't Stop The Dance as recorded by Bryan Ferry. 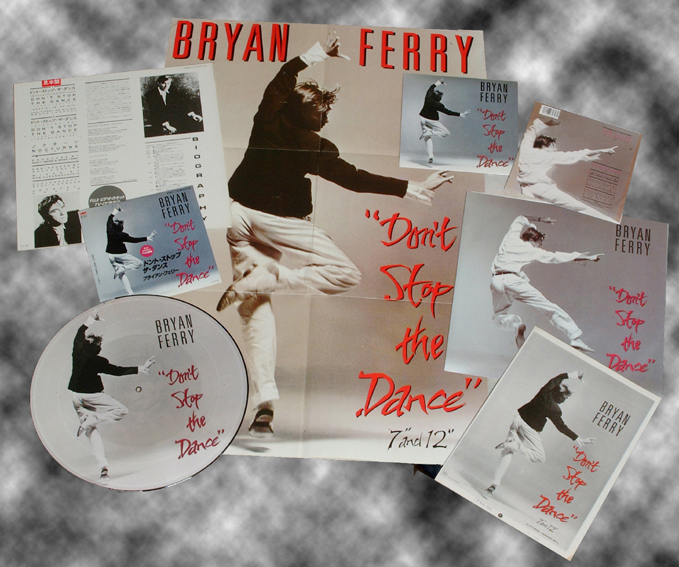 Don't Stop The Dance was the second single to be released from Bryan Ferry's Boys And Girls album in 1985. The single was edited by Bob Clearmountain and was coupled with an instrumental called Nocturne. The single peaked at number 21 in the UK charts in September 1985. A special 12" re-mix was also done for the 12" single release, which included an instrumental version of the song, and also on the limited addition 12" picture disc. The 12" version appeared on CD for the first time on the "Price Of Love '89 R'n'B Remix" CD single. The single and Instrumental versions have not appeared on CD as yet. The video was styled by fashion photographer Stevie Hughes. The song was played throughout Bryan's 1988 tour and a live recording from Glasgow 10th December 1988 was used as the b-side to Your Painted Smile in 1994. Don't Stop The dance was also performed at some dates in USA & Japan on the Frantic tour in 2002 and also throughout the Dylanesque tour. Don't Stop The Dance was given a re-mix for the single release. The song had a new intro with the 4 bar instrumental passage after the second chorus edited out. This version was used for the promo video and has never been available on CD before. The USA 12" promo had this version c/w the album version. David Sanborn Sax - Other musicians not specified.